The low-cost companies are to be strongly affected by Brexit. Because of the leaving proceedings from the European Union, the United Kingdom finds itself unable to join the Open Skies agreement and therefore in need to negotiate the access to the single aviation market. The price that Britain could be forced to pay might be to accept the supremacy of EU regulations and possible air free movement of workers. EasyJet Chief executive Dame Carolyn McCall declared the company remained “confident” in the strength of its business model after Britain voted to leave the EU. Still, the same Dame Carolyn urged the European Commission to prioritize British airlines remaining part of the EU aviation area “given its importance to trade and consumers”. In a statement on Monday, EasyJet stated that the operating environment in May and June for European airlines had been “extremely challenging”. Low-cost companies’ shares have fallen sharply, some by more than 20% after the voters have chosen the Brexit. Furthermore, Europe should allow British operators access to the single market, but it is likely that the Europeans will obtain a higher cost. Meanwhile, competing companies such as Lufthansa and Air France could take the opportunity to restrict the powerful operators such as EasyJet, in the European area. Two deadly explosions at Istanbul’s Ataturk international airport killed 36 and injured more than 140 people. According to one senior Turkish official, the death toll might rise to 50. Three terrorists armed with bombs and guns ran open fire near an entry point to the terminal. Security guards exchanged gunfire with two suspects carrying AK-47 rifles and both attackers detonated suicide bombs as they reached the first security checkpoint at the Ataturk airport. The third assailant detonated his explosives in the airport’s parking lot. Prime Minister Binali Yildirim said that early signs suggested the so-called Islamic State was behind the attack. And the recent bombings looked like a major co-ordinated assault which, could either be linked to IS or to Kurdish separatists. Turkish President Recep Tayyip Erdogan responded by urging Western countries to take a firm stance against terrorism. The bombings created deadly carnage and the crowds were panic stricken. Ataturk airport has been a vulnerable target for long. The X-ray scanners at the entrance to the terminal are there but the security checks for cars are limited. Images from the terminal showed bodies covered in sheets, with glass and abandoned luggage littering the building. Relatives of those missing gathered outside a local hospital where many victims were taken. Lack of information created anger and panic amongst many. Flights were suspended after the attack, and with the US Federal Aviation Administration grounding all services between the US and Istanbul. The airport was closed overnight for several hours, and flights into the airport had been diverted to the capital of Ankara and other cities. Limited flights have now resumed at the airport. Taxis and ambulances were used to rush casualties to hospital. While no terrorist groups have claimed responsibility for the massacre, Turkish security forces believe Isis was behind the attacks. Buy2Greece.com – How Brexit will affect tourism sector in Europe? David Cameron has announced his resignation as Prime Minister following the UK’s vote to leave the EU. Britain voted for Brexit by 52% to 48%. Following the result, value of pound reached the lowest level since 1985. With the advent of the peak travel season where thousands of tourists have planned to enjoy a vacation in Europe, is facing the dilemma about the probable effects of the ‘leave vote’. They are yet to discover the immediate changed prices in the commodities and tickets which in future will lead to further hikes. The immediate query that is hitting the blocks is whether the holidays will cost more. The answer lies in what the value will be settled at before the referendum. According to the Treasury, the predicted sterling would lose 12-15 per cent of its value on a Leave vote. But in longer terms, the two major key rates are against the euro and the dollar. The €:£ rate is fulcrum to all international companies including the tour operators, businesses etc. Generally, travellers prefer to visit the foreign holidays which has single-currency area. Be it Spanish Costas, Italian cities, French countryside or islands of Greece – they all have to maintain a decent €:£ rate. According to the industry experts, the destinations in Asia and America like the US, Dubai and China will also see a proportional rise. In many cases, the currencies are locked to the US$. How the pound price and $:£ rate is essential as it affects the oil price, aircraft costs etc. So, following a 12% fall in the sterling will push up the price of petrol, diesel and aviation fuel, as well as the cost of aircraft for airlines such as British Airways and easyJet. www.Bu2Greece.com -How Brexit will affect tourism sector in Europe? Emphasizing the growing role that technology plays in the meetings world, key findings of new research carried out for IMEX America by Meeting Professionals International (MPI) show that more than 40 percent of the MPI Research Panel members surveyed use laptops or mobile devices to capture content realtime. Of that group 10.5 percent of these professionals always use them for note taking and 31.6 percent use them sometimes. Handwritten notes continue to be the choice of the majority (57.1 percent) while just 0.8 percent record their observations. In this same research conducted in May, IMEX America also asked MPI members what the ideal length of a traditional conference presentation by a single speaker should be, excluding Q&A. 43.6 percent thought 30 minutes, 40.6 percent chose 20 minutes, 15 percent said it should be 15 minutes and only 0.8 percent selected 10 minutes. The latest reports from Post Office found that the UK vacationers are rushing to get foreign currency ahead of the EU referendum. On a comparison with the same time of the last year, the Post Office has seen surge of sales of currency up to 74%. The holidaymakers are rushing to get cash and lock it before the vote which, according to the industry experts can wipe more than 20 per cent of the value of the pound. Post Office Travel Money, which accounts for one in four foreign exchange transactions in the UK, has found that branch sales of foreign currency were up 48.8 per cent on last year. At the same time, the online purchases of currency were as high as 381 per cent. Ahead of the May Bank Holiday, sales started to ascend and remained consistent. The Post Office assured it is handsomely funded and is not worried about a shortage of foreign cash. According to a pre-paid currency card, FairFX, there has been a 300% rise in the holidaymakers exchanging money expecting a good rate but the businesses were holding back. A money transfer website, Transferwise has decided to suspend all pound transfers before the vote given the volatility of the currency. Predictions about the value of the pound following the referendum have been a major debate all over. According to some industry experts, the pound could fall to parity with the euro, where £1 equals €1. On the other hand, some specialists think if Britain votes to stay in the EU, pound might spike to its highest level this year. AccorHotels COO John Ozinga spoke about the France-based company’s strategy and development plans and gave the rationale for some of the company’s recent deals. PARIS—John Ozinga, COO of AccorHotels’ ownership and investment division HotelInvest, said his company is eyeing global growth as its parent company wraps up a wave of major mergers-and-acquisitions activity. AccorHotels, based in Paris, has 15 brands and an overall room count of 511,517. At press time, its market capitalization was €8.6 billion ($9.6 billion). The company is aggressively growing its lodging footprint with the April buy of alternative accommodations provider Onefinestay and the pending $2.8-billion acquisition of FRHI Holdings Limited, which includes luxury brands Fairmont, Raffles and Swissôtel. When the FRHI merger is finally completed, it will add 115 hotels and 43,000 keys to AccorHotels’ platform. In October 2014, AccorHotels acquired a 35% stake of design-led boutique chain Mama Shelter. Having a large international footprint allows issues in one region to be offset with growth in others, Ozinga said. In a world of constantly changing economics, Ozinga said AccorHotels sees the need to constantly tweak its offerings. “Our goal has been to restructure our portfolio and step out of leases, which we can do by different means, by the sale and franchise-back of properties or by renegotiating leases on individual or portfolio bases,” Ozinga said. Ozinga said AccorHotels completed 48 sale-and-franchise-back deals in 2014 and the number of transactions nearly doubled in 2015. AccorHotels has bought several portfolios in recent years, which Ozinga said is the preferred approach over acquiring individual properties. Ozinga said the company will likely do more selling than buying in 2016. In January, the company announced its intent to sell 85 European hotels for an asset value of €504 million ($565.5 million). Projects in the United Kingdom and London are high on AccorHotels’ priorities, Ozinga said. The company has five hotels in the pipeline, including the 313-room Novotel London Canary Wharf and the 196-room Ibis Canning Town, London. Both properties are scheduled to open in 2017. “We have a very accepted brand family in the U.K., which allowed us to secure projects in very sought-after locations such as Canary Wharf,” Ozinga said. China is AccorHotels’ largest focus, Ozinga said, which was evident in January when the company struck a deal to obtain a 10.8% stake in Chinese hotel firm Huazhu Hotels Group. Ozinga said he was not worried either about industry cycles or real estate values. What’s more, Colliers International predicts Chinese outbound real estate investment to increase by 50% this year, a healthy growth that is sure to be much welcomed around the world. Clearly, Chinese property investments overseas are not tapering off anytime soon, so how are you addressing this market? We share 10 nifty tips to start you off on the right foot with your Chinese buyers. Whenever you receive leads, try your best to call or email them right away. The early bird catches the worm, and it couldn’t be more true than with Chinese buyers as well. The sooner you respond, the higher your chances are in securing Chinese buyers. This might prove difficult for those of you in different time zones than China, which is an issue that everyone must find a way to overcome if you’re targeting Chinese buyers in China. Some people try a time shift and work part Asia hours, while others might have someone on the ground for them to respond to interested buyers more quickly. If you’re planning to email or call your Chinese buyer, it might help to use their Chinese name – it’ll help establish a more familiar connection with them. This is often displayed in the email sent from us at Juwai.com and often, it will only be their surname, which means you’d only be able to address them as “Mrs. Li” or “Mr. Chang”. Alternatively, you could also copy/paste their name in Chinese into your email. Extra tip: To up the ante, hire a Mandarin speaker even if he or she is a college intern – that is one surefire way to smoothen the initial process. When reaching out to your Chinese buyer, clearly state where you obtained their information from, such as telling them that you obtained their information from their listing enquiry on Juwai.com. This way, they won’t be confused as to why someone from another country or someone speaking in another language is contacting them. It will also add credibility to know that you are contacting them through Juwai.com – a network that they are familiar with and will remember using. 80% of China’s high net worth individuals (HNWIs) are active WeChat users, so asking your Chinese buyer to add you on WeChat is essential. This is the method in which they communicate with the most, which means it’ll be your best route to effectively communicate with them. It’s the first way that Chinese connect online nowadays, so it’s a good way to gauge your potential success. After all, if they’re comfortable enough to accept you on WeChat, then they may be more receptive to your pitch as well. Extra tip: In the chat features, there is also a button that allows you to translate Chinese text into English, which can help ease the language barrier a bit. Have pluck – follow up continuously and regularly. Within the Chinese market, consumers are constantly fed information for products and services everywhere they go, so it requires stamina and tenacity to get your message across and in front of them. Whenever possible, small talk can be good as well to build your guanxi (a.k.a your relationship and credibility) with Chinese buyers a bit. Provide useful information relevant to the key motivations driving Chinese property investment abroad – education offerings, existing Chinese community, investment opportunities and yields, and emigration or visa updates. Every bit of information you provide them that might be useful is information that may spur action in them. Local university is accepting student applications? Let your Chinese buyers who have expressed interest in sending their children overseas know. Add a personal touch by inviting them to visit you, and if you’re really dedicated, offer to host them by showing them around so they become more acquainted with your city and country. This is a personal touch that they will really appreciate, and it’s an opportunity to build an immense amount of guanxi, trust, and goodwill with your Chinese buyer. Extra tip: It’s also a good idea to introduce them to your local offices and agents as well to show you are legitimate. Introduce your Chinese buyers to the local Chinese whom you know to breed a certain sense of familiarity. At the same time, don’t forget to connect them with useful contacts that can offer services they need, such as financial advisors or interior designers. Likewise, to help you better understand Chinese and their culture, we recommend you take a trip to China to observe firsthand their environment and the market. At the same time, it will provide you the opportunity to invite them for a personal meet-up while you are in their city. Remember, Rome wasn’t built in a day. Success with Chinese buyers cannot be rushed, and working with Chinese buyers – most who are foreign property investors unfamiliar with your city and country – would naturally require longer time frame and patience. So continue to work your leads by providing them useful updates, and soon you will reap the fruits of your diligence in due time. Chinese are charting an all-time high in terms of property investments in the US – CNBC reported the Asia Society and Rosen Consulting Group’s latest study charting and forecasting Chinese investment in the US revealed Chinese investors spent $8.5 billion on commercial property in 2015 alone. This suggests that Chinese overseas property investment is largely unaffected by the economic slowdown back home. 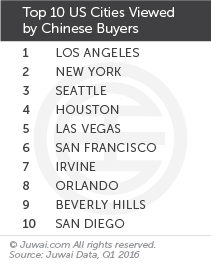 Where are Chinese buying in the US, though? Unsurprisingly, Los Angeles and New York City (NYC) both retained their ranks as the #1 and #2 most-viewed US cities. New US cities appearing in the top ten in Q1 2016 include Las Vegas (#5), Beverly Hills (#9), and San Diego (#10). PARIS—French hotel owners are increasingly looking to expand their global footprints as their home country persists through a depressed economy and as Paris hotel demand sits below levels seen before the November terrorist attacks. “We remain focused on all of Europe, and it depends on where the opportunities are. … The advantages of doing portfolios are that they allow us to accelerate the process and create value for the group,” Ozinga said. “Add to that (capital expenditure) and it is a virtuous circle that improves operating margins. Philippe Doizelet, managing partner of business consultancy Horwath HTL, said decreasing exposure in France makes sense for French owners, mostly because the French real-estate market has changed fundamentally due to pressures on the economy. Doizelet said that for a long time revenue per available room in France was heavily correlated to gross domestic product at current values. According to STR, parent company of Hotel News Now, the Paris hotel market has seen mostly negative performance from November 2015 to April 2016 in year-over-year figures. Occupancy has declined over the previous year during each of the six months, according to the data. In December 2015, Paris’ occupancy dropped 19.5% to 59.7%. In April 2016, occupancy fell 15.1% to 67.3%. RevPAR saw similar declines, as the metric decreased by an average of 12.4% during the six-month period, including a drop of 22.3% to €136.76 ($155.82) in April. Average daily rate saw growth in November and December but decreased during each of the first four months in 2016. The largest decline in the six-month period happened in April, when ADR fell 8.4% to €203.30 ($231.63). Recent accounting practice changes in France have altered the landscape, Doizelet said. He said in the 2000s AccorHotels had recurrent deals with French bank Societe Generale, but at some point this was challenged by accounting practices, as it was all debt. “In 2004, AccorHotels did its first deal with Foncière des Régions, for 104 hotels, deals based on 100% variable leases, so that there was no predefined type of debt or financial commitment and part of the revenue was pre-empted,” Doizelet said. 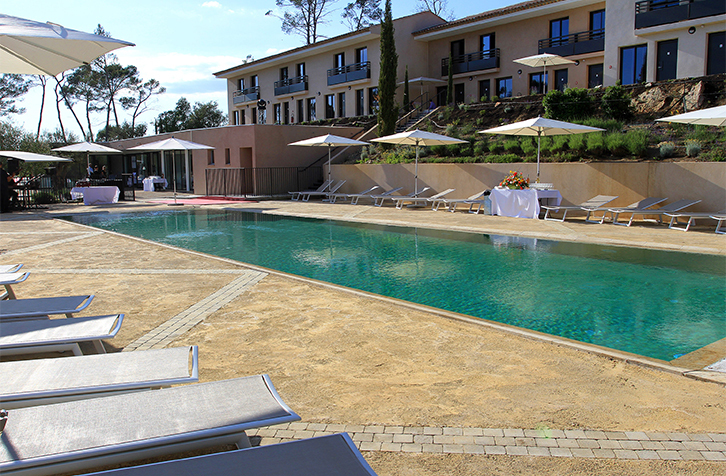 Doizelet said he saw Foncière des Régions’ strategy over recent years adapt to lessen its exposure both in France and with AccorHotels. Although French ownership companies are considering acquisitions and transactions outside of France, there are still deals to be made within the country. In January, AccorHotels announced a €504-million ($574 million) deal to spin off 85 properties—61 of which are in France—in a new joint venture with Paris-based Eurazeo, which owns 70% of the portfolio. Of the 85 hotels, AccorHotels owned 28, while 57 were owned by Paris-based Foncière des Régions and AXA. In May, Foncière des Régions acquired two portfolios via subsidiary FDM Management worth €936 million ($1.07 billion). The transaction included nine German properties that will be managed by Event Hotels and an additional nine, mostly independent properties in France and Belgium that will be managed by FDM. On the real-estate side of the ownership-operations equation, values remain strong in France and have picked up in 2016. “Values are higher as there is confidence in the hotel market, and there are lots of players trying to get in,” Doizelet said. Ozanne said that hotel ownership remains among the four strategic pillars of the company, the others beings French and Italian office and German residential ownership. Ozanne said Europe could continue to improve, and the continent’s hotels will rebound. Doizelet said that with both AccorHotels and Foncière des Régions at the helm of French ownership initiatives, the outlook is good for French hotel owners, even if the domestic economics of the country might occasionally shake domestic hotel performance. He added it is prudent for hotel owners to spread risk across both geographies and hotel flags.